Brixen, Italy – 15/03/2018 Durst, manufacturer of advanced digital production technologies, has confirmed that Italgrafica Sistemi, of Italy, will be the world's customer for the new OMET XJet. Powered by Durst, the integrated hybrid solution for a wide range of high-performance labels and packaging printing will be installed at its headquarters in Castelgomberto, in the province of Vicenza, in the early summer. Together with OMET, manufacturer of printing and converting machines, the two companies are providing a complete hybrid print and finishing line to Italgrafica Sistemi that will offer an unlimited flexibility and a wide range of final applications with a consistent cost reduction. It chose the OMET XJet because of the ability for in-line multi-process configurations that finalizes products in a single pass. Italgrafica Sistemi is an €11m-turnover company with 50 employees who work two shifts. With 18 printing lines already running at Italgrafica Sistemi, the new OMET XJet is expected to replace two of the flexo lines as demands continue to increase for short-run, personalised technology in a single pass. It will open up new opportunities for cold foiling, printing on reverse and adhesives, as well as varnish and diecutting. Francesco Niorettini, General Manager of converter Italgrafica Sistemi, said the total cost of ownership and benefits to his customers were crucial in the decision-making. "This investment opens up a new world of opportunity," he said. "It allows us to give far more choice to the market and produce so many more different types of labels for any kind of job. By including the Durst Tau, we will be able to broaden our portfolio by combining all the technologies together. "What is also really important is to ensure that we retain the same high level and definitions produced with flexo and offset - and the Durst / OMET hybrid will enable this. Other factors in our investment decision included the 50 percent increase in speed, the low service and consumable costs, as well as the fact that both Durst and OMET have good reputations in the marketplace." Mr Niorettini added: "We'll be saving huge amounts of money and time. We expect a 20% saving in overall production costs and will benefit from faster start-up times, which will enable us to offer a wider product range. As one example for, say, a four-colour job we expect to increase the productivity of the machine by 40 percent with faster set-ups. In addition, we will be saving around 70 percent in material waste by using digital." Helmuth Munter, Segment Manager Labels & Package Printing at Durst, said: "Italgrafica Sistemi is one of the increasing numbers of forward-thinking companies that are seeing the huge benefits of using the best technologies in a complete 'all-in-one' printing process. This ability to combine digital inkjet printing with conventional pre- and post press printing and finishing world, offers our future customers a highly cost effective solution. "In addition, the feedback we received from our recent Durst Digital Days has also convinced us of how customers perceive future market opportunities to increasingly involve UV inkjet digital in flexible configurations or as a complementary technology. It's the future." The jewel in the crown of the Durst and OMET partnership, the new OMET XJet, is the new hybrid printing platform integrating Durst's Tau RSC 330 digital inkjet system with OMET X6 flexo stations and converting units. Durst inkjet technology together with OMET X6's finishing and converting units assure reliability and excellent results at every run, with the advantage of obtaining the final product in one single passage. The OMET XJet hybrid broadens the opportunities for label printers thanks to its flexible configuration. Italgrafica Sistemi's configuration provided through distribution partner LIRMAprint will feature an unwinder, two flexo units, the Tau 330 RCS, another two flexo units, a diecutting mono twin system, and a rewinder. The Vision automatic registration system is also included and the system has an option to print on adhesive, laminate and other applications to create coupons and special labels, including peel-back versions. It can be seen as three presses in one or used as a hybrid solution, flexo stand-alone or digital stand-alone according to the length of the run or the level of personalization required. Brixen, Italy - March 22 2018 - Durst, a manufacturer of advanced digital printing and production technologies, has announced the first installation of the Durst Delta SPC 130 printing system in Austria at Rondo Ganahl AG. The leading corrugated board manufacturer will produce packaging and displays with offset and flexo technologies at 6 locations and will set up its digital center at the St. Ruprecht/Raab branch. The focus will be on the Durst Corrugated flagship Delta SPC 130, which achieves print speeds of up to 9,350 m2/h based on Durst single-pass printing technology and, in combination with Durst Water Technology, enables sustainable and odorless packaging products. With this investment, Rondo, which has recently been awarded two Wellpappe [corrugated board] Austria Awards, is responding to changing demands in the corrugated board market that requires rapid and flexible solutions for the sampling, versioning and personalization of promotional activities. In particular, the trade and brand manufacturers are also looking for partners that support them with seasonal promotions, special editions and individual products in a timely and high-quality manner. Other print service providers in Austria have recognized this and invested in the Durst Delta WT Corrugated Multi-Pass printing systems. Rondo is going one step further by relying on industrial productivity and scalability with Durst Delta SPC 130 single-pass technology. "We're delighted that our digital Durst Delta SPC 130 high-performance printing system that we produce for the corrugated board industry from our location in Lienz, East Tyrol has also impressed Rondo, an innovative manufacturer in Austria," says Christoph Gamper, CEO of the Durst Group. "In line with the motto 'Innovation made in Austria', we see a high degree of awareness concerning market situations, as well as a very high level of willingness to lead the way as a first-mover and to create new impulses, particularly in this market." Durst founded the Corrugated Packaging & Display Printing segment in 2016 in order to promote digitization in the corrugated board industry. After initial customer installations of the Delta WT 250 Multi-Pass printing system, Durst developed the Delta SPC 130 high-performance printing system. This system is based on the latest generation of single-pass printing technologies that Durst already deploys in its Label Printing and Ceramics Printing segments. Alongside the more cost-efficient production of shelving and sales packaging in small- and medium-sized job runs, the Delta SPC 130 also supports sampling, customizations and versioning - directly and without setup costs. With the development of a marking-free ink system based on Durst Water Technology, Durst already enables odorless and sustainable packaging products in the food retail sector. With this innovation, Durst was able to impress Schumacher Packaging in Germany in 2017 and to gain the company as its field test partner for readying the product for market. The field test is now in its final stages, in which additional peripherals and third-party solutions are tested so as to further increase the level of automation. With this continuous development, Durst is providing the investment security that is necessary to accelerate digitization in the corrugated board industry. Lienz, Austria – 13/02/2018 – Durst, a manufacturer of advanced digital printing and production technologies, has launched a new printing platform – the P5 series. The first member of the family is the large format printing flagship, P5 250 HS, with shipping starting from April. Durst’s iconic industrial design, which was originally developed by the famous Ottl Eicher, has gone a further step with the P5. A design studio from Munich canvassed opinions from many customers andoperators with a view to integrating their wishes into a new concept. This has been achieved for the P5 – and feedback will be incorporated into many Durst product lines in the future. Christoph Gamper, Chief Executive of Durst Group, said: “The new P5 platform, including workflow software and advanced service tools, represents our key strategy to further invest into large format printing technology and further afield. We believe that there is a lot to explore in this market space and the P5 250 HS is our first statement. In an integrated world, printers need to change as well. With the P5 family we provide tools for change and profit – and our firm commitment to continue to lead the innovation in the large format market. With the launch of the new Rho 163 TS HS in November 2017, Durst and 3M are continuing on this successful path and providing enhanced production capacity, digital workflow and economical small runs. 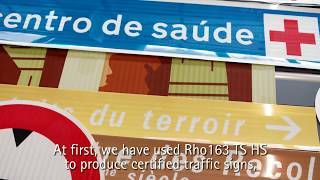 Learn more from a customer, who produces with all systems including the new Rho 163 TS HS. Brixen, Italy - 09/02/2018 - Passionate and positive customer feedback will help shape Durst thinking for future events after record attendances at the "inspiring and engaging" Digital Days at its world headquarters in Brixen, northern Italy, that concluded today [February 9]. Guest speakers at the latest edition of the the renowned international open house included Rick Hulme from Sunjet, who discussed Inkjet Ink Development for Labels, and Package Printing and Color Alliance's Rainer Esters who gave an overview of Durst's Web To Print Solution. Bettina Offenegger also detailed Durst's Symphony Workflow Solution and Manuel Gruber focused on Durst Label Global Service. Customer experiences took centre stage, too, with David Webster, The Label Makers UK managing director, speaking the Tau 330 and the Tau 330 RSC beta test, while Ramon Krieg, Technical Production Manager at BMZ in Switzerland, explained how its Tau 330 with Low Migration Ink was building impotant new business opportunities. Mr Webster said: "Durst has been an incredibly supportive partner with fantastic technology, which is why I was only more than happy to come along and play an important role with a presentation on each of the three Digital Days. Installing the Tau 330 RSC has been another huge step for us. The Durst Tau 330 RSC prints at phenomenal speed and is far more cost-ffective for us because it is using less ink, but still mainaining the incredible print quality. The future of most label production wll be inkjet." "Digital is now the clear preferred choice for us for smaller runs," said Mr Krieg at the Durst Digital Days. "I believe that inkjet is the future, particularly now that our Durst Tau 330 is so cost-effective to run because there is no preparation time needed when you change jobs. And more of our work is increasingly short run." Visitors also saw in action the Low Migration ink Tau 330 with Chill Roller and Insertion System suited to primary food and pharma packaging as well as the economic entry model Tau 330E with its specially developed high pigmented UV inkjet inks. Durst's, manufacturer of advance digital production technologies, also demonstrated its Web2Print solution for online design, preview and ordering of all kinds of packaging products including labels, folding carton. Durst's own Workflow-Label Application Suite was also showcased. This is modular, expandable prepress software for order entry, pre-press, RIP, color management, ink-costing and production data management. Helmuth Munter, Segment Manager, Durst Label & Package Printing, said: "The three days were packed with market knowledge, technical expertise and thought leadership aimed at helping attendees think differently about how they can improve the way they manage their business. Our customers are passionate about the work they produce and the growth of digital and inkjet - it's the future. The Durst Digital Days also armed them with many ideas on how to better support their customers and grow their business through the adaptable solutions we provide as a true partner." "In particular, our proprietary single pass UV inkjet technology delivers the flexibility for fast and efficient production of the highest print quality for an expansive range of label and packaging applications. Small, medium, and now long runs are highly profitable with our digital systems. Thanks to a cost-effective total cost of ownership we provide, the options are virtually unlimited and open up an enormous potential for new products and services in an ever-changing market." Brixen, Italy - 15/02/2018 - Durst, a manufacturer of advanced digital printing and production technologies, has used the CEVISAMA 2018 Ceramic Tile and Machinery Exhibition in Valencia, Spain, to unveil more details on its full digital glaze line currently undergoing industrial field testing. After more than six years of research and development to create a complete glazing line capability of integrating a fully digital process based on an open system, Durst has confirmed that first customer installations are scheduled to start later this year. The solution incorporates latest-generation Durst glazing, printing and finishing technologies that can work with glazes that are similar to conventional products. On its stand at CEVISAMA 2018, Durst unveiled the Durst TRUE Full Digital Tile Production Workflow 4.0. The workflow was highlighted alongside production systems on the stand. These were the Durst Gamma DG Digital Glaze Printer and Gamma XD Printer, as well as the Durst ColorGATE True Ceramics Color Management Solution. Durst's single-pass glaze printer uses patented Durst RockJet® printhead technology, specifically developed and manufactured by Durst specifically for the ceramic glaze properties. It is the only technology that can handle water-based glazes with large particle sizes up to 45 microns, which is similar to traditional glazes. The Gamma DG Digital Glaze printer features high resolution structures as used in the majority of the structured tiles produced, but has unlimited variations, as well as an ability to creative innovative and unique designs composed of different glazes on the same tile. These include gloss and matt finishes. Durst's XD Series next-generation digial ceramic décor printer has been designed for easy and fast maintenance and service. It boasts unrivalled print quality with no banding or lines, low grain visibility, excellent uptime and reliability, low maintenance and service costs. Other benefits include long printhead duty cycles with no purge or ink waste and a dry belt-cleaning system. The ColorGATE True Ceramics Color Management is unique because it is the only solution with ultra-fast patch reading printed on flat or structured tile surfaces. It has fast color matching for new and repeating jobs, specifically desinged for ceramic inks and production conditions. Patented "Fingerprint" color control takes into account any variation over time, for example glaze or firing conditions. Norbert von Aufschnaiter, Durst Group's Segment Manager, Ceramics Division, said: "We had many more visitors to our stand at CEVISAMA 2018 than in previous years. Visitors were extremely interested in the latest developments in our Durst Digital Full Glaze Line latest-generation technology, which is on track. These are exciting times and we're confident of starting installations later this year." "The resultant line will guarantee maximum versatility, flexibility and quality, as well as extremely competitive management costs, space rationalization optimization of production and a high degree of management control through process automation." Brixen, Italy - 08/02/2018 - Durst, manufacturer of advanced digital production technologies, together with OMET, manufacturer of printing and converting machines, have strengthened their collaboration with the introduction of the new OMET XJet. Powered by Durst, the integrated hybrid solution for a wide range of high-performance labels and packaging printing guarantees flexibility and cost savings. The jewel in the crown of the Durst and OMET partnership, the new OMET XJet, is being officially presented to more than a 100 customers from across the globe at Durst's Digital Days at its Italian headquarters in Brixen, northern Italy. The three-day event is dedicated to the best digital label and packaging printing solutions. The OMET XJET is the new hybrid printing platform integrating Durst's Tau 330 digital inkjet system with OMET X6 flexo stations and converting units. It can offer an unlimited flexibility and a wide range of final applications with a consistent cost reduction thanks to the in-line multi-process configuration. Durst inkjet technology together with OMET X6's finishing and converting units like cold foil, hot foil, lamination, varnishing, die-cutting and slitting assure reliability and excellent results at every run, with the advantage of obtaining the final product in one single passage. The OMET XJet is powered by Durst Tau RSC, the high-performance UV inkjet printing press featuring 330 mm (13") print width with maximum print speed of 78 linear meters/min (245 ft./min) at 1200 x 1200 dpi resolution. Thanks to its eight color stations (CMYK+W+OVG) with new designed high pigmented inks it delivers outstanding print quality with 98% pantone color gamut coverage. Helmuth Munter, Segment Manager Labels & Package Printing at Durst comments: "We are very pleased to partner OMET in the launch of this highly professional hybrid printing solution. It combines the best technologies of both, the digital inkjet printing and conventional pre- and post press printing and finishing world, offering our common future customers a highly cost effective and complete "all-in-one" printing process." Marco Calcagni, OMET Sales and Marketing Director, added: "We managed to create a complete Made-in-Italy printing solution that meets the market trends of personalization, just-in-time deliveries and final product variation, but also maintaining all the capabilities of a conventional press. I believe that Durst is the right partner for such a challenging project because they have deep knowledge and the best digital inkjet technology acknowledged by the international market."